Tip: Where petals and diagonal lines join, a slip stitch may be used, but the effect is much prettier if the hook is removed from the work, inserted in the petal and the stitch drawn through without turning the work. This gives a right and wrong side. Ch 11, sl st into fifth st from hook to form centre ring or circle, ch 3, sl st in third ch beyond sl st just made, ch 3, turn, sl st in centre. 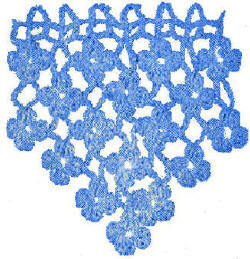 This makes 3 stitches of a 4 st petal; make another petal (ch 3, 2 dc, ch 3, sl st) into centre; ch 3, 1 dc in centre. Ch 5, sk 2 ch, dc for a sp, ch 8, turn. Dc over previous dc, ch 2, dc into centre st of ch 5; ch 4, sl st into tip of free petal, or remove hook, insert in petal and draw st through, ch 11 for new flower, sl st into fifth ch from hook, ch 3, sl st into third ch from sl st, ch 3, turn, sl st into centre. Ch 3 to begin new petal, dc in centre, sl st into middle st of long ch (ch 7), dc into centre, ch 3, sl st to centre. Start a new petal with ch 3, dc in centre, then ch 4, remove hook, insert in middle or tip of next petal of end flower, draw loop through and ch 11. Work another flower as from * to *. You now have completed the second row of two flowers, ch 7 and sl st to point where other ch 7 joins dc sp. Ch 5, dc in next dc, ch 8 for loop, turn, dc into dc, ch 2, dc in middle st of ch 5 sp. To begin next row of flowers, ch 8, sl st in fifth st from hook, ch 3, sl st to third ch from sl st to form petal, ch 3, sl st to centre; make half of next petal, sl st to ch 7 by removing hook and picking up middle st, complete petal. Make half the next petal, ch 4, join in tip of petal below, ch 11 to start a new flower, connecting as before. When increasing number of flowers to a row always work half of each flower, then complete outside flower and finish others as you work back to sps. As you work along, all will seem easier and you can make width changes as desired.